Creating a children's picture book - my writing process revealed! People often ask me about how I write my stories and what it involves to create a children’s picture book. To this end, I have attempted to summarise the process. I am sure that writers all work very differently and so this is simply an account of my own experience. When I wrote The Day My Teacher Came to Tea and Birthday Cake Disaster, the storyline ideas had already formed in my head before I put pen to paper. I had already developed the story frameworks, and had a good idea about the key events that needed to happen. That said, there was a lot of flexibility within these frameworks, as I am a great believer in letting the writing take you on a journey rather than the other way around. Since I wanted to write in rhyming verse the biggest challenge with both these books was figuring out how to say what I wanted in simple language that rhymed. The one thing you soon discover when writing for young children is that the pool of vocabulary available to you is quite limited! The process for writing My Crazy Purple Pen and Captain Sillyvoice and his Pirate Band, were different; more spontaneous. With the story about the pen, I simply asked myself one question and it was this, “What mischief could a cheeky, magical pen get up to?” I put (my own purple) pen to paper and began. The story evolved from there. I was always thinking in the back of my mind about characters and situations to which I thought children would most identify. 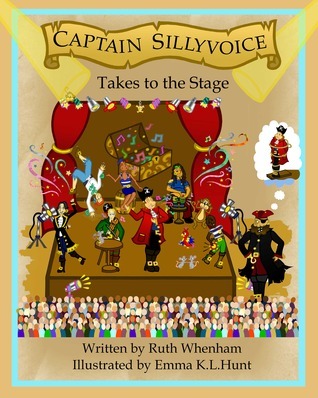 The Captain Sillyvoice story was developed in much the same way, in that I came up with the concept of a most unlikely, jolly Pirate Captain, by the name of Sillyvoice and asked the question, “How could a Pirate Captain, who is not mean or tough and who has a silly voice to boot, able to become successful in the pirate world?” I knew the answer would be his wonderful singing ability but it was only during the writing process that I worked out exactly how. I have written two further Captain Sillyvoice adventures and a sequel to My Crazy Purple Pen. In the case of these stories I've had a firmer idea at the outset about what should happen but there was very little detail until I put pen to paper. Stage 2) Draft, draft and draft again! It has been known for me to write a first draft within one afternoon (although normally it takes a few days). I then leave it alone for while, come back and take a fresh look and edit. I do this at least 5 times. I always read the text out loud because it's super important in rhyming verse that it trips off the tongue easily. This is probably the most difficult thing to get right; for me anyway. Once I think I've got the story into a reasonable shape, I ask close friends and family to read it through (out loud as though reading to a child). This is a really good way to find out which sentences cause them to stumble (indicating that the sentence structure is too awkward). The other thing this process can pick up is when the reader automatically says the sentence in a different order to the way it is written down (i.e. their brain may just switch a couple of words around because it is the way they anticipate that it will be). Creating the illustration notes takes as long as writing the text. In some ways it is the most fun because this is when you really start to visualise how the book is going to look. I write very detailed notes for the illustrator about what the characters should look like and about what needs to be happening on each page, including details of any speech bubbles and also suggestions for objects or activities that should be featured. I work with a very talented artist, Emma K.L Hunt, and fortunately we seem to share the same vision for the stories. Emma has coped brilliantly with interpreting my ideas and has created a whole host of wonderful characters and scenes. How she comes up with so many different faces, outfits and so on, I really don't know! She adds in lots of her own lovely details, such as the brilliant little mice who appear throughout the Captain Sillyvoice books. Although we have never actually met, we email regularly to perfect each page. The final illustrations rarely end up exactly as first envisioned, much like the text - they evolve (as ideas spark other ideas) and this is how it should be! So, there you have it! This is how my books are created. If anyone has any questions or would like to make any comments then please do. I would love to hear from you, as always!